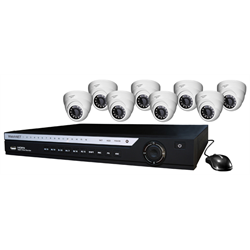 The EVI-16KIT8-13IRB from WatchNet is a coax camera kit that includes a 16 channel DVR and 8 1.3 megapixel dome cameras. 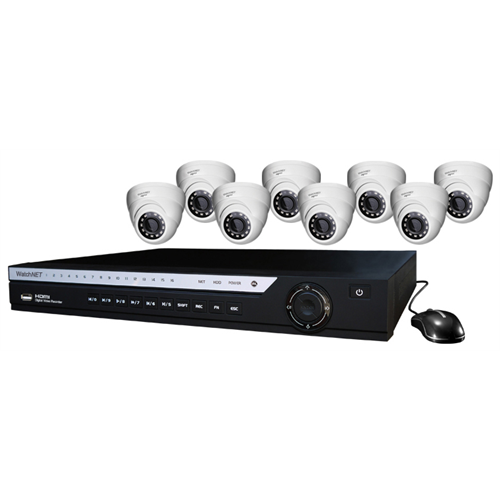 The included EVI-1613 DVR comes with a 2TB hard drive and a dual-core embedded processor. It can support up to 16 cameras at any given time. H.264 video compression gives the DVR extended storage time on the 2TB hard drive provided. It can optionally support up to two 12TB HDD. The 8 XVI-13IRB cameras that are included transmit video over either twisted pair (balun) or coax cable up to 1500 feet. IP66 rated housing makes them ideal for use outdoors. During the day, they’ll record in full-colour HD using a 3.6mm fixed lens, and upon detecting low lighting, they’ll switch to using infrared night vision. They can detect objects up to 30 meters once in this mode in pitch black.